For a unique look create a sign to your own specifications. Choose from our wide variety of colors to compliment most any decor. Select the text you would like to appear and the size of your sign and we will configure your message for best appearance and readability. Signs are available with different mounting options: Double sided tape applied to the back of the sign, Velcro hook and loop fastener can be applied, Magnetic tape, Screw holes or Clear adhesive applied on front of sign. • Paragraph text may be charged a higher rate if text exceeds character count for sign size specified. 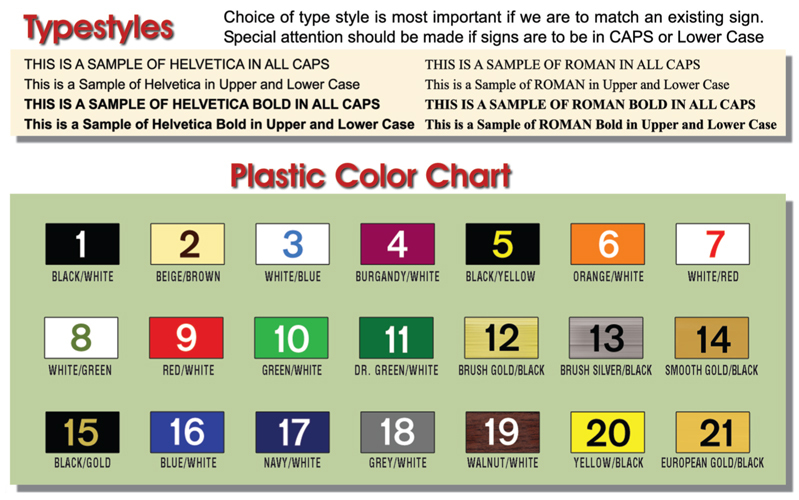 • Metal frames are available for larger signs. Each sign priced individually, please inquire.